Use this form to reserve the Thornbury Park Pavilion. You or a guest must be a Township resident in order to reserve the pavilion. There is no cost for reserving the pavilion. Permits will not be issued more than 90 days or less than 48 hours in advance of the event. For events with more than 100 attendee's, a certificate of insurance will be required. Attendee's must park in the lower parking lot by the salt storage shed. Please acknowledge that you have read and accept the rules and regulations in Park Ordinance #3 of 2007 by clicking the field next to "Park Ordinance #3 of 2007". For more information, call 610-399-8383, Ext. 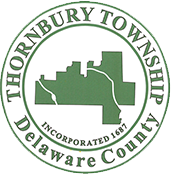 107 or email Geoff@thornbury.org.